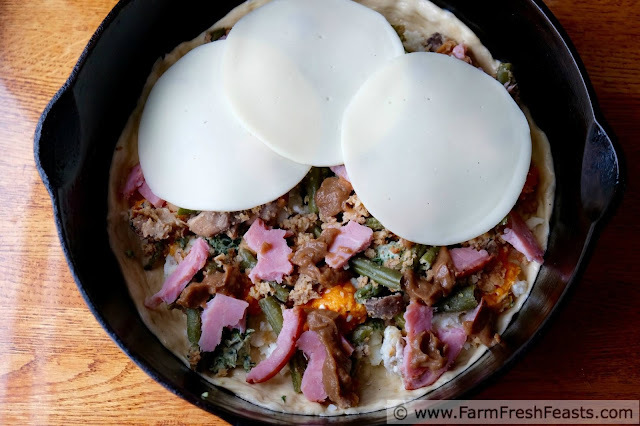 A deep dish pizza with ham, green beans and sweet potatoes sandwiched between a mashed potato-spread pizza crust and a layer of provolone cheese. Turn those leftovers into a Friday Night Pizza! You may be wondering why, the day after Thanksgiving, I'm talking about Easter. It's quite simple--last year we had multiple Thanksgiving celebrations and I ended up with leftovers of both ham and turkey. 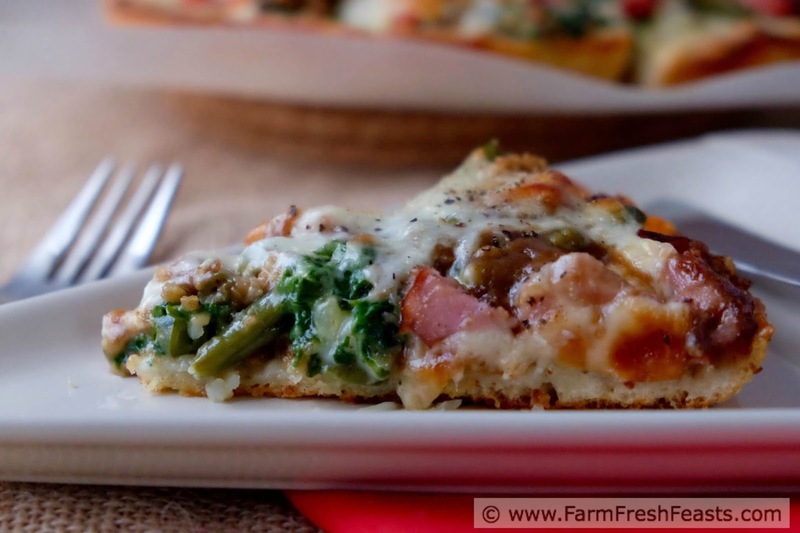 I used the turkey, cranberry, and stuffing in my Deep Dish Thanksgiving Leftovers Pizza and made a different version with ham & green beans. 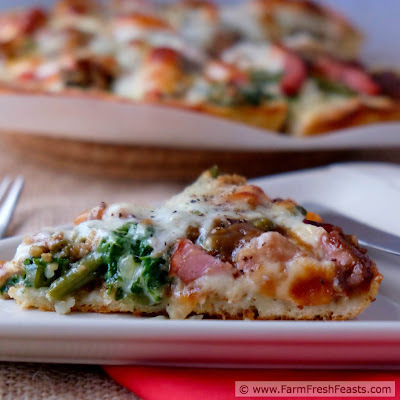 I'm calling it Easter Leftovers Pizza because for Easter we usually serve ham, green beans, sweet potatoes and of course no holiday is complete without MA's Make Ahead Irish Mashed Potato Casserole. 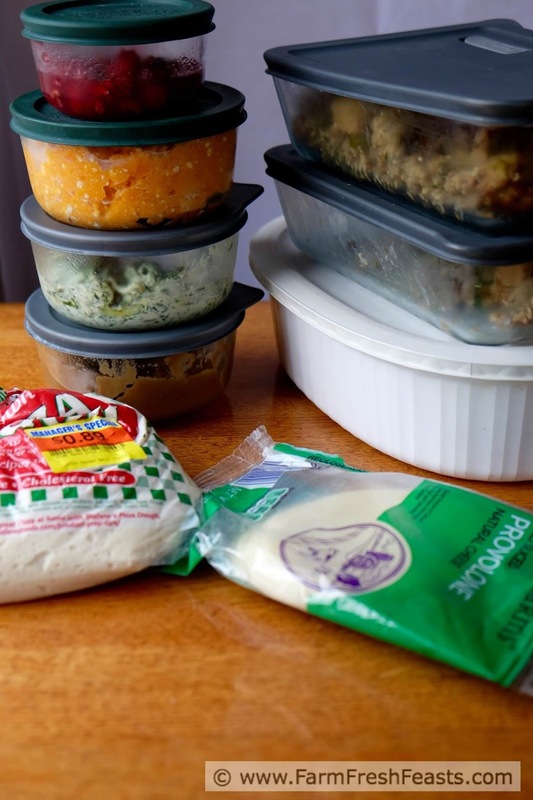 Finding ways to repurpose your leftovers into something the family will enjoy is one way to reduce food waste. For more ways, please check out my Food For Thought--Reducing Food Waste post. I must say I preferred this pizza, with ham & Alanna's World's Best Green Bean Casserole, to the turkey, cranberry, and stuffing version. I'm not sure why, taste is subjective after all. Perhaps it's because I just really love my turkey leftovers in sandwiches spread with Cranberry Salsa. As an aside, I had my first Thanksgiving Leftovers sandwich last night, on a Buttermilk Potato Roll--recipe from Donna Currie's Make Ahead Bread: 100 Recipes for Bake-It-When-You-Want-It Yeast Breads (Amazon affiliate link) spread with both cranberry salsa and sweet potato casserole. Yum. This book was an early birthday present to me from my daughter, and I'm really looking forward to baking more from it. Consider it as a Christmas gift for the baker--or wannabe baker--in your life! For more pizza recipes, arranged in categories like Pizza Dough recipes, Savory Pizzas with Fruit, Pizzas with Meat and Vegetarian Pizzas, all alphabetical with thumbnail photos because that's how I roll--please check out my Visual Pizza Recipe Index. I've also got a Friday Night Pizza Night board on Pinterest, if you follow me there. I suppose I ought to include here that I'm now on Instagram. And, as ever, I'm sharing stuff that catches my eye on my FB page. Would you like to know how to Use This Blog best? 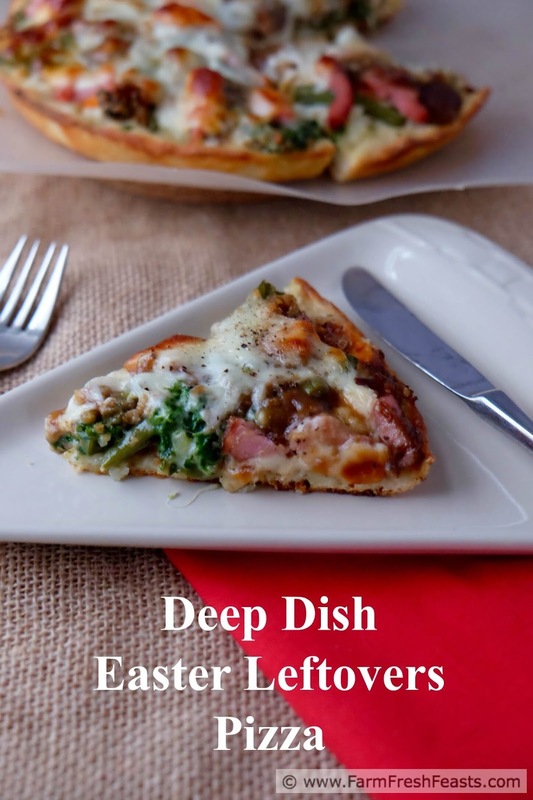 For general pizza making hints and tricks, plus loads of photos because I am a visual learner, please see My Pizza Primer. I pretty much dumped my years of pizzas-at-home experience out onto the post. I did forget a few things, though, so I that's why wrote up my 7 Tips for Successful Pizzas at Home post. Any questions, throw 'em up on my FB page where I help folks troubleshoot their pizza problems. Preheat oven to 400 degrees Fahrenheit. Add a splash of olive oil to a 10 inch skillet (I use cast iron). Stretch a room temp ball of pizza dough across the base of the skillet and a wee bit up the sides. Brush the crust with olive oil, then spread a thin layer of mashed potatoes on top. Dot ham, green bean casserole, sides and gravy evenly across the mashed potatoes. 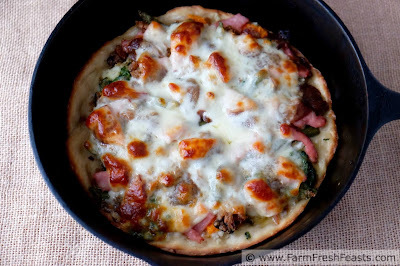 Bake for 25 to 30 minutes until cheese is melted and leftovers are heated through. Lift out of skillet and cool on a rack for 5-7 minutes, then transfer to a cutting board or back into the skillet to cut and serve. Oh my, I already have this bookmarked. You are really making hungry with this one. Thanks for bookmarking! I've bookmarked your sorrel soup just in case I get sorrel in our farm share. Sorrel was the first new-to-me produce item I encountered a decade ago in my first CSA, and I never could figure out what to do with it before it turned slimy and became compost. 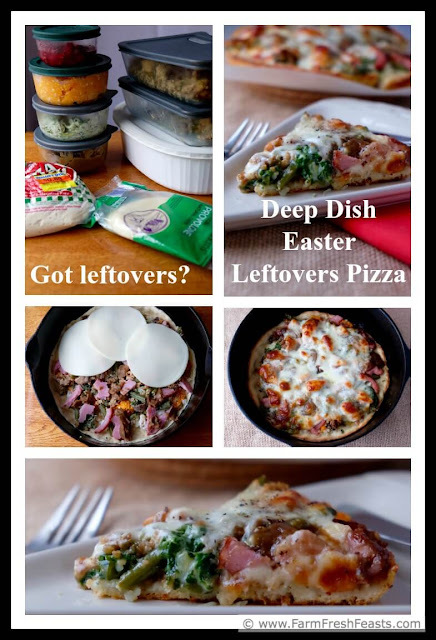 It looks like both you and I are looking for pizza post Thanksgiving, mainly because it's simple, easy and uses those leftovers. Granted mine used eggs, which aren't necessarily a holiday leftover so um...I guess my point is moot. Oops. Pizza, pizza. I think it's traditional to want to break free from the post-holiday food coma with a pizza. I'd be using eggs with abandon except that my egg producer's 6 yr old son now thinks it's fun to drop the eggs he was sent to gather . . . so our farm fresh eggs are at a premium this week.